I hadn't expected to wake up in Africa. Well it looked like Africa. I was confused. I was still wrapped in sleep. As the bus stopped, I squinted through the window, shading my half-opened eyes from the glare of the dying but defiant afternoon sun. Outside, the city was very much awake. A living, breathing mass of people coming and going, buying and selling, meeting and greeting. The bus doors opened, and the stale air trickled out, along with some of the more impatient passengers. I heard a strange language that sounded almost English. Or was it Jamaican? And then it all came back to me. The bus had left the tiny town of Flores, and the rain-soaked jungles of Guatemala, just over five hours ago. We were now in Belize City, Belize - a former British colony, with a large Creole population. I dragged my over-laden rucksack off the bus and out onto the busy dockside. 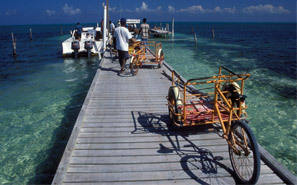 I knew there was a boat service to the cayes, but that was all I knew. At the ticket office, I came face-to-chest with 'Big Keith'. The slogan on his t-shirt said it all, 'No Problem'. Keith introduced himself, helped me to buy a ticket, and ushered me into his rapidly-filling skiff. Nose-up and at full throttle, the skiff headed out to sea, crashing through every wave - its 25 passengers gripping the handrail and holding their stomachs. Three-quarters of an hour later, we stopped at Caye Caulker - the now gentle purr of the engine accompanied by a collective sigh of relief.